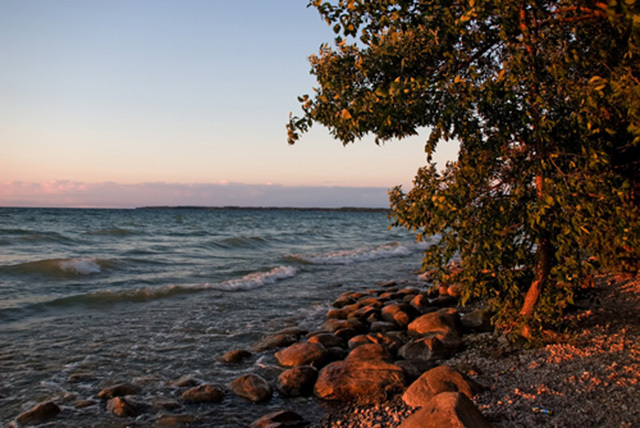 Lake Simcoe was formed by glacial meltwater and is southern Ontario’s largest interior lake. It’s length is 48 klm and width is 29 klm, it’s maximum depth is 136 ft.It’s east and west sides are eskers(coarse gravel ridges ) and shores are drumlin hills formed by a mix of granite, sand and gravel deposits left by the retreating glaciers. Also left behind were wetlands, swamps and marshes like Holland Marsh and Keswick Marsh that formed in the depressions. Raised beaches of sand and gravel are all around the lake most prominent at Barrie. For more than 200 years Lake Simcoe was the most important waterway in the history of Ontario.Prior to 1793 they’re were no roads, travel in Canada was either on the Great lakes, the St. Lawrence or the Ottawa and French rivers, but when John Graves Simcoe became Upper Canada’s 1st Lieutenant Governor he wanted a shorter and safer route through to the interior. By 1797 he had Yonge St. built to connect York to Holland Landing to connect to Lake Simcoe. The North West company and others set up several fur trading posts around the Lake. When the Americans invaded in 1812 this new route played a pivotal role in transporting troops and supplies to keep the country from falling into American hands. By 1820 land grants were given to war veterans to settle around Lake Simcoe’s shores. Farming, fishing, logging, quarrying and draining swamps became the livelihoods of many of the settlers. As these small communities grew necessities like gristmills, flour mills, sawmills and wollen mills shortly followed. Transportation, communication, and trade depended on the lake which spawned a shipping industry that prospered for over a 100 years. Steamships hauled wood such as white pine and sawmills prospered. They also carried goods, farm produce, and limestone. The ice industry at Bell Ewart and Jackson’s Point was once the largest in North America because of the lakes pure spring fed waters. The decaying swamps became the richest vegetable gardens in the world. Country manors, hotels, dance halls, and camps flourished with the influx of tourists and large elaborate steamships carried them to points all around the lake. By the 20th century most of the lumber had been cut, rail travel had replaced the ships commercial importance and blacksmithing and ice cutting had all but vanished. World War 1 and the depression terminated tourist excursions and resorts were abandoned. Small communities dwindled and disappeared. It wasn’t until after World War II that people returned to build cottages resorts and permanent homes.